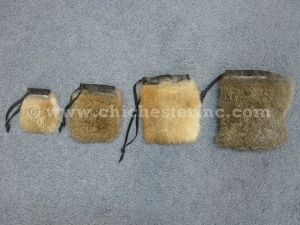 These multi-purpose Rabbit Fur Bags are made using natural-colored rabbit skins and cow leather. Colors vary. Genus and species of rabbit: Oryctolagus cuniculus. Ranch raised. Genus and species of cow: Bos taurus. Ranch raised. Rabbits are not an endangered species and are not subject to CITES controls. They are a by-product of the food industry. There are no export controls on these items.